Not a lot of detail at the Warner Archives catalog listing, but it does claim the film is “newly remastered.” No clips available online for checking out the image quality, unfortunately, but it’s got to be an improvement over the VHS tape that many of us have held onto for years (or the DVD bootlegs made from that tape or from TCM showings). Interestingly, the catalog page says the movie is “16×9 Full Frame.” I always thought “full frame” meant the old-school 4:3 TV ratio, but maybe the terminology has changed with widescreen TVs. Or maybe this is an error. I’m sure they wouldn’t bother to remaster it if they were going to release it 4:3 (would they?). Until the job market improves I’ll be sticking with my VHS copy, so I won’t be reviewing this in the near term. If you get it, let me know how it is! Thanks to Toby in the comments and Jason via e-mail. The Outfit is available for $19.95 from the Warner Archives. Don’t know if they’ll work, but there is mention of some coupon codes in the comments section. This is terrific news! So far no Warner Archives have been released Pan and Scan, so I have confidence this will be the widescreen version. Like you, I’ll be able to finally retire my p&s version I’ve had for years. Thanks for the heads up! This Warner Archives is a smart move. I’ve heard you can also custom order things. They don’t own The Split do they? No news to any regulars here, but The Outfit is actually quite a good movie. Not as awesome as the book, but a decent effort and possibly the best Parker adaptation to date. WAC is not a custom made situation. They have a specific list of films available and they make them upon demand rather than have a deep stock of the discs. Like you I hope The Split becomes available since like The Outfit it’s MGM and the WAC has a lot of their back catalogue available. Hmm, maybe I’m getting mixed up. I know one of the studios is offering custom DVDs as others in the nerd-sphere were crowing about the release of Thundarr on DVD. I also heard on ad on the Adam Carolla podcast for the Warner archives which made it seem as if you could pick and choose. I guess it makes sense though as they won’t just transfer an entire film for one dude, unless the technology gets cheaper. Is there a way we can make a request for the Split? Sorry for the repeat link to the WB Archives…just noticed it at the bottom of the original post…..
Hey, no problem! Link it as often as possible. If this one sells, maybe we’ll get The Split. Although, really, only completists like me have any business paying for and watching The Split. I actually like The Split, and while it’s not a great film, it’s got an interesting cast, and it entertains. It’s still got the smell of being a ‘studio’ film right before things went more iconoclastic, American Cinema-wise, and it’s not a very good adaptation of a Stark, but it has it’s moments, and I’d love to have a full DVD copy of it for my collection. But then again, I’m a completist, too! 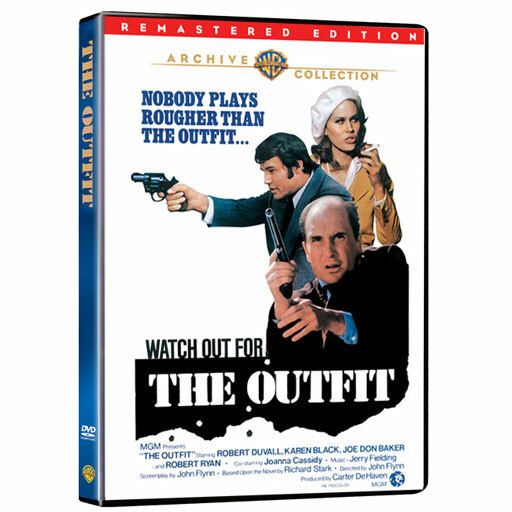 I got my copy of “The Outfit” today from WB Archives. Sadly, it’s not widescreen. What they did was take the original 4:3 aspect ratio and chopped off the top & bottom so it would fit a 16:9 frame. I compared it to a recording I made off of TCM & that’s exactly what WB did. I sent them a scathing email about this. Ah, yes, open matte. I guess it just bothers me because I’ve seen it so many times on TV & I notice stuff not in the picture. I don’t have a problem with open matte as that’s usually something done as the film is being shot, at the discretion of the director, as opposed to pan and scan which is just a way to make the film fit the dimensions of the tv after the fact. I’ll withhold judgement until I actually get a copy of the WAC disc and compare it to my converted avi file of The Outfit. Thanks for the heads up, though, CLM, as I’ve got many WAC’s and have found hardly any of them lacking when it comes to Aspect Ratio, and only finding problems inherent in the source prints that they use as far as wear and tear. But mostly I’ve been watching stuff like their Film Noir’s, silents, short collections and other classics pre-1960. Jeff, the open matte process doesn’t hurt “The Outfit” at all; I just overreacted. I had forgotten that in the 70’s, some movies were shot that way, I think in anticipation for TV viewing in the future. A clever way to avoid the pesky pan-and-scan process. A definite improvement, and probably pretty close to the way it was projected in quality theatres at the time of it’s release! 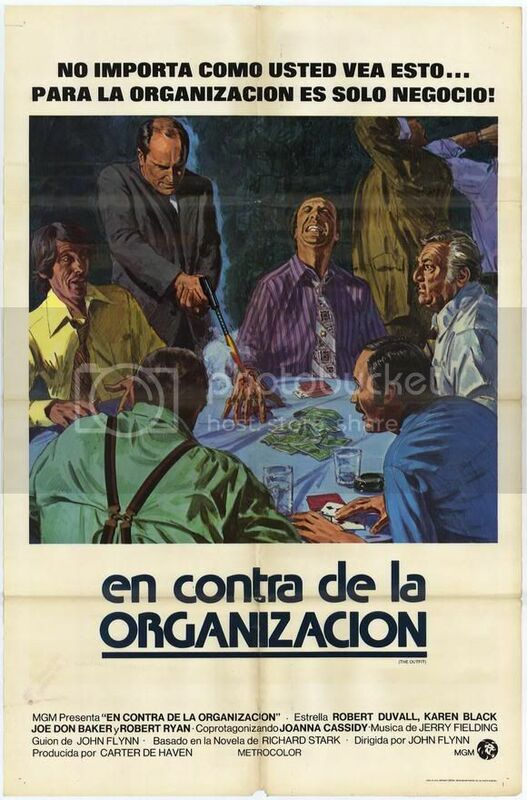 Here’s a great foreign poster for The Outfit! My late friend John Flynn directed this movie, and considered it one of his best….great cast, very true to Westlake’s world. Hopefully, someday his Rolling Thunder will get the proper release it deserves in the US. My second favorite John Flynn film! Many thanks for this good news. I’ve sought this out periodically for years. And one from DVD Beaver with technical analysis!